Trump asked Coleman.Coleman’s response, though inaudible to the press, left Trump with a chuckle and a smile.The call came around 6:30 p.m. Monday as the President and first lady Melania Trump spoke on separate phones to children whose calls to NORAD had been patched through to the White House lines. 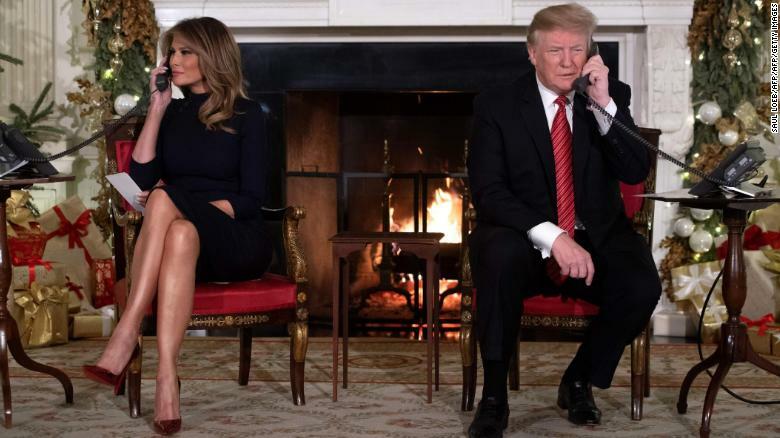 The Trumps answer calls from people to the NORAD Santa tracker phone line Monday at the White House.In front of a crackling fire and between two Christmas trees, Trump wished Coleman a Merry Christmas and asked the child’s age and Christmas plans and wondered how school was going.”Well, honey, happy Christmas, and you just take care of yourself and say hello to your family, OK? Say hello to everybody,” Trump said.In another phone call, Trump took a child’s belief in Santa as a given.”What’s Santa going to get you for Christmas?” he asked, according to pool reports. “Have a great Christmas, and I’ll talk to you again, OK?”Melania Trump said on Twitter that helping children track Santa “is becoming one of my favorite traditions!” The couple participated in phone calls last year as well. Helping children across the country track #Santa is becoming one of my favorite traditions! @Potus and I enjoyed working with @NORADSanta – #ChristmasEve92.2K7:13 PM – Dec 24, 201834.5K people are talking about thisTwitter Ads info and privacyNORAD, the North American Aerospace Defense Command, has made a tradition of using its radar system to track Santa on his trip around the globe every Christmas Eve.The tradition, which began with a phone line mix-up in 1955, continued this year despite the ongoing government shutdown. CNN’s Aaron Pellish contributed to this report.